An Oklahoma pharmacy's agreement not to provide drugs for an execution in Missouri represents a new roadblock to lethal injections — one that has some death penalty advocates saying states must come up with another method a squeamish public can stomach. Missouri insists it will still be able to impose the ultimate punishment on child-killer Michael Taylor next week, but the latest litigation underscores the growing difficulty states face in obtaining chemicals to use on death-row inmates. Prisons have turned to compounding pharmacies for the lethal solutions because anti-death-penalty manufacturers — many based in Europe — have stopped selling to them. Now, it seems, some loosely regulated pharmacies may be deciding the sales are not worth the trouble. The trade group representing compounders says it wishes correction officials would find another place to buy the drugs. "I have been telling folks for years that this cat-and-mouse thing is going to become too exhausting for the states," said Dudley Sharp, a Houston-based victim rights advocate who supports capital punishment. "Theyre going to have to not just switch drugs. They’re going to have to switch methods." While some lawmakers have raised the spectre of a return to firing squads or electric chairs, Sharp says those methods are too "gruesome" for modern American sensibilities and will never come back. 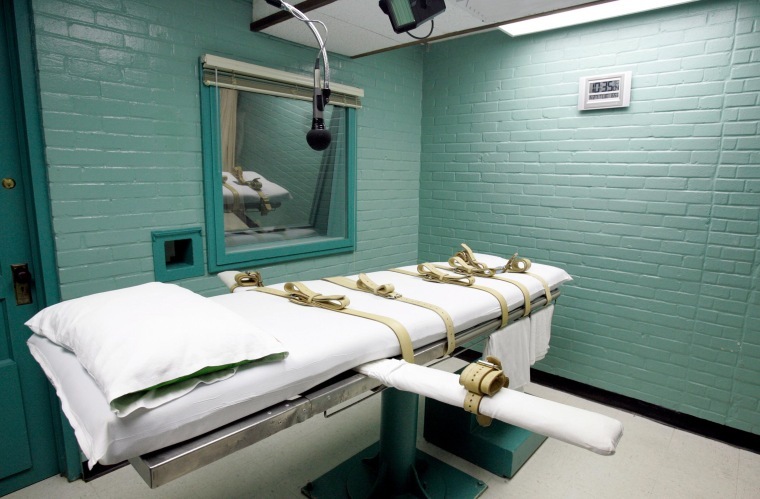 "As long as the death penalty is constitutional, there will be a way to carry it out." Instead, he thinks executioners should use nitrogen to "peacefully" asphyxiate condemned prisoners. Michael Rushford, president of the Criminal Justice Legal Foundation, envisions a "depressurizing chamber" that would induce deadly hypoxia. "I think the dirty little secret is states will come up with an alternative that is unchallengeable," Rushford said. At the moment, though, states are focused on defending their drug protocols and ensuring supplies for the almost two dozen executions that have been scheduled nationwide so far this year. Until about 2010, most death-penalty states used a three-drug cocktail that was upheld as constitutional by the U.S. Supreme Court: the anesthetic sodium thiopental, the paralytic pancuronium bromide, and heart-stopping potassium chloride to stop the heart, causing death. In 2011, Hospira, the sole U.S. producer of sodium thiopental, stopped making the drug, and the European manufacturer balked at exporting it to the U.S. if it were to be used in executions. Manufacturers of substitute drugs like pentobarbital have also refused to supply it for executions, forcing states to turn to compounders, who mix specialty drugs from their basic components. Defense lawyers argue that's illegal, claiming the lack of oversight prevents jailers from guaranteeing an execution won't be agonizing enough to violate the constitutional protection against cruel and unusual punishment. They have attacked states' attempts to keep the names of the pharmacies secret — Georgia's highest court is set to decide soon whether it's legal — and it's easy to see why. After the name of one Texas supplier, Woodlands Compounding Pharmacy, became public in October, the pharmacy found itself "in the middle of a firestorm" and demanded that the state return the drugs. This month, lawyers for Taylor, the Missouri murderer, filed suit against The Apothecary Shoppe in Tulsa, Okla., which has been identified in court papers as a supplier to some death-penalty states. On Monday, the compounding pharmacy settled the suit by agreeing not to provide any drugs for Taylor's Feb. 26 execution. "We are gratified by that result," said Taylor's lawyer, Matthew Hellman. Sarah Lees, a spokeswoman for the Apothecary Shoppe, would not say if it was getting out of the death-chamber business altogether. "Legally, I cannot answer your question," Lees said, refusing to comment further. The International Association of Compounding Pharmcies says it has no "formal position" on its members supplying executions, saying it's up to each druggist. Nevertheless, it said in a statement that states "should work first with the pharmacy services providers — the companies that provide medications to prisoners within their systems — to source or compound drugs for executions before soliciting a traditional compounding pharmacy." Missouri officials said they can proceed with the execution without the Apothecary Shoppe's help, but would not say whether they obtained pentobarbital from another. The state also has a backup protocol: a cocktail of the sedative midazolam and painkiller hydromorphone, but that could come with its own set of legal obstacles. "They're going to have to not just switch drugs. They’re going to have to switch methods." When that mixture was used in Ohio last month, convicted killer Dennis McGuire took 25 minutes to die and reportedly gasped for air — prompting the governor to halt the next execution until an investigation is complete. Richard Dieter, executive director of the Death Penalty Information Center, which opposes capital punishment, said despite the problems, states are still figuring out a way to execute inmates. "They're creative," he said, suggesting that prisons may eventually create their own compounding pharmacies to ensure they're always stocked. "My sense is that as long as the death penaty is constitutional, there will be a way to carry it out. It won't be stopped because we just can't figure out a way to kill people." NBC's JoNel Aleccia contributed to this report.